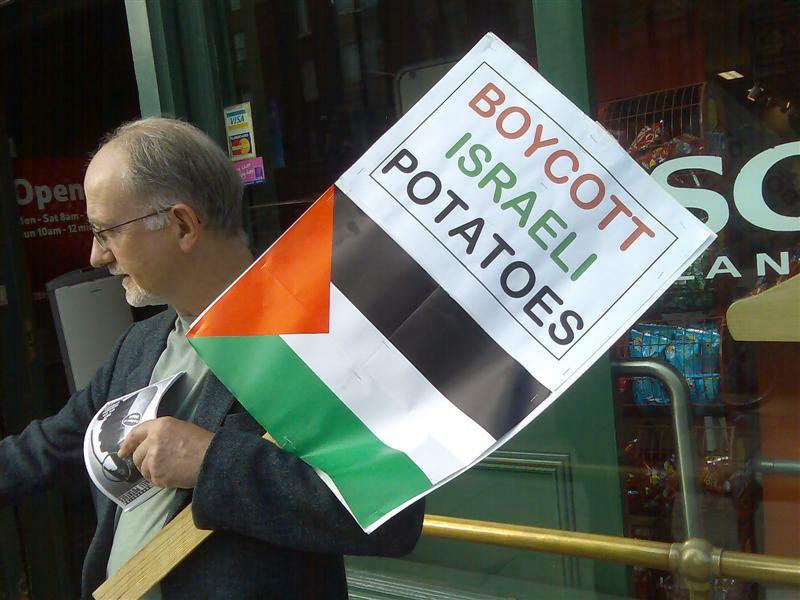 IPSC activists continued their boycott Israeli potatoes campaign with a picket outside SuperValu on Aston Quay, who continue to stock Israeli potatoes and other goods. 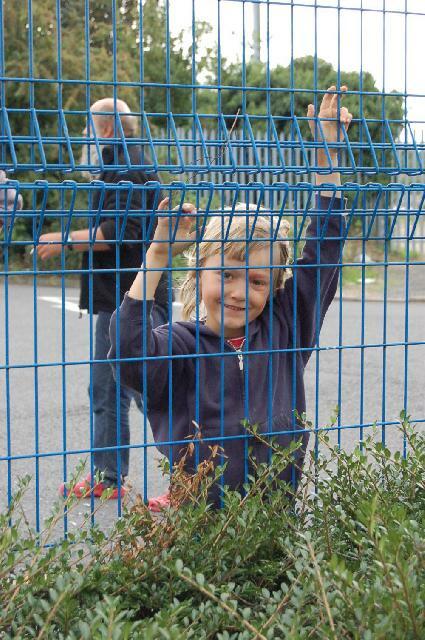 10 activists from the IPSC staged a two hour picket outside SuperValu on Aston Quay. 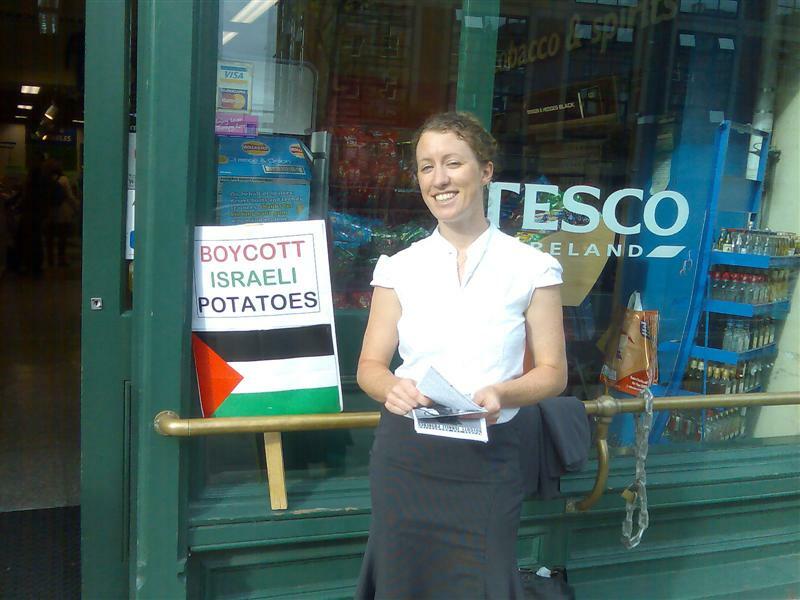 They distributed 500 leaflets informing consumers about the presence of Israeli spuds on Irish shelves and asked shoppers to consider boycotting these potatoes and other Israeli produce in an act of solidarity with the Palestinian people and as a method of exerting pressure on the Israeli State to end its human rights abuses in, and brutal occupation of, the Occupied Palestinian Territories. In South Africa, an international boycott played a significant role in ending apartheid. You can help defeat the brutal apartheid system that Israel is imposing on the Palestinians. We think of the common potato as being part of Irish history. We may imagine that all potatoes sold in Irish shops are grown in Ireland. 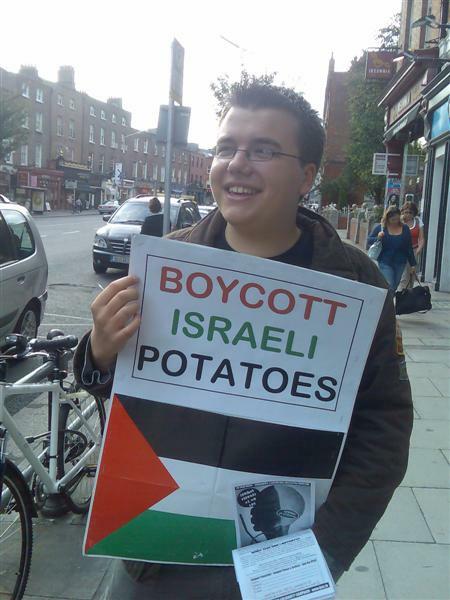 However, many Irish shops and supermarkets, including Dunnes Stores, Tesco and Marks & Spencer sell Israeli Potatoes, rather than Irish spuds. The profits from, and taxes imposed on, these goods help Israel to maintain and expand its 40-year old illegal occupation of Palestine. 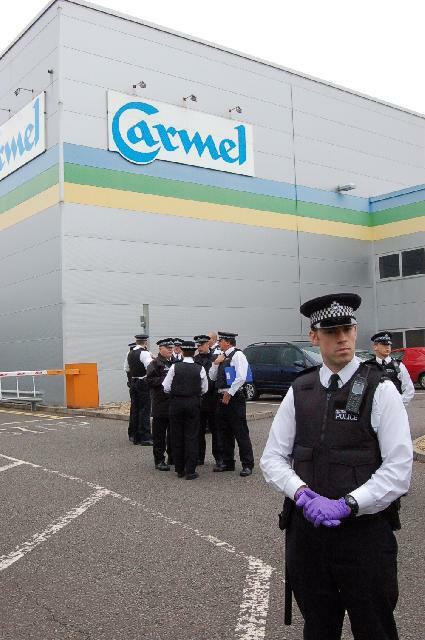 For example, the largest exporter of fruit and veg, Carmel-Agrexco, is half owned by the Israeli State. On top of this, often the potatoes are grown by illegal settlers using stolen Palestinian water - many precious West Bank water aquifers are under Israeli military control with Israel deciding who gets the water, and when. Israeli settlements in the West Bank never face water shortages while it is an all too common feature for Palestinains despite water coming from exactly the same sources. To add insult to injury - along with orchards and olive groves - Palestinian arable agricultural lands are often targets of destruction by both the Israeli military and illegal settlers. In addition those Palestinians trying to export perishable good regularly face obstacles and/or the destruction of their produce by the occupation forces. Almost all 'organic potatoes' on sale in Irish supermarkets at this time of year are from Israel and the IPSC asks you - as an act of solidarity with the Palestinian people - not to purchase them and to complain to the management about their continued presence on Irish shelves. You should also be on the look out for out of season New Potatoes which are also usually of Israeli origin. On a recent trip to my local supermarket there were 4 different varieties of Israeli potatoes! 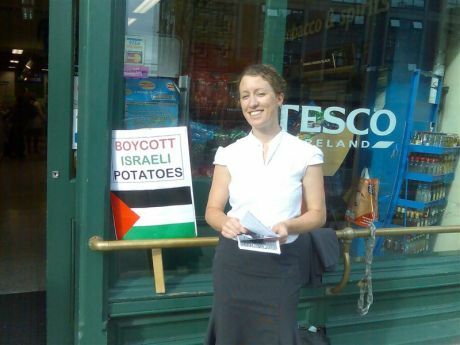 The ONLY Irish potato on sale wele from their 'Value' range..
For more information re calls to boycott Israeli goods click on link below. I think having a perishable good put on an airplane to be sold on the other side of Europe is madness. This alone warrents a protest! I agree with many of the points that the IPSC are raising. The abuse of the Palestinian people should be stood up to. But I don't think boycotts are the way forward. It's very unclear who is being targetted in a boycott campaign. The Irish store? The Irish government? The Israeli producer? The Israeli workers? Are Irish capitalists that produce goods to gain from people switching to another product? Do IPSC support 'native' capitalists over Israeli ones? There is also a philosophy behind boycotts that are highly individualistic. It's up to individuals to make buying decisions and if they don't make the right ones they are somehow to blame for what's happening in Israel. Boycotts fill certain peoples self-satisfaction that they are doing something and all others are wrong and are to blame. Very petty-bourgeois. Boycotts can also help capitalists sow divisions among the working class if not taken up in a class way. 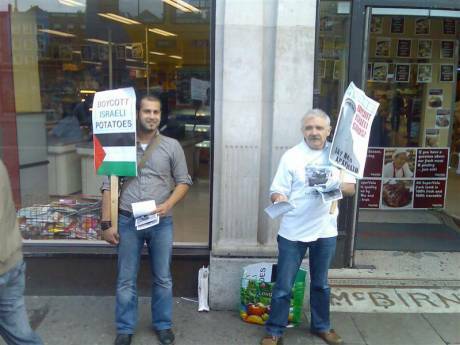 The Israeli working class will be sacked if these potatoes are not sold and make profits for their bosses. Yet, there is no slogans defending Israeli workers rights coming from the IPSC. Surely anyone interested in the fate of Israel-Palestine would stand up for all oppressed - both Israeli workers and the Palestinians. The examples of Coca Cola in Colombia and South African goods in Apartheid will be thrown back at me. But there is a big difference with these protests. The SA boycott was called for by workers' organisations in SA and it was backed by workers' organisations in Europe. This cuts across the individualistic nature of boycotts and it answers questions about potential divisions in working class. Similarly with Coca Cola the boycott was called by a Workers' Union and it was implemented largely by Students Unions and indeed supported by trade unions also. Totally different situation. Dan Rather - rather than concentrating on potential benefits to Irish potato growers or Irish capitalists from the boycott (which is irrelevant when the raison d'etre is to end the injustices suffered by Palestinians) our focus should at this stage be concentrated on the impact which a boycott has on the Israeli psyche. The opprobrium to which Israelis are subjected everywhere they turn (as many of them discovered recently in Galway) because of their illegal and morally reprehensible actions supersedes all other considerations of workers rights. If Israeli workers are concerned about their rights then they too should be on the front line demanding an end to the their governments subjugation of the Palestinian people. Palestinians in Israel and may Israelis have supported the call for a campaign of boycott, divestment and sanctions in the full knowledge that they too will be impacted by the campaign. The oppressed do not want be used as human shields to protect the oppressors - the Israeli military already does enough of that. Writing in Foreign Affairs magazine, Republican candidate, former New York mayor, crazed redneck and AIPAC whore, Rudy Guilini, has come out against the creation of a Palestinian state. Giuliani writes the U.S. should oppose Palestinian statehood because it would inevitably encourage terrorism. Giuliani also says he would consider talks with Iran but left open the threat of weakening Iran’s economy and destroying its nuclear facilities. Today's edition of Haaretz is reporting that : " The opening of 'Israel Week' at the Galeria Kaufhof department store in Berlin spurred a demonstration on Saturday against Israeli food products originating in the territories"
"Protesters held signs reading 'No to settlement products' and 'Stop the Israel-EU Association Agreement'". "Groups protesting included The Jewish Voice, a Jewish-German organization opposed to the occupation, and Solidarity with Palestine and German teenagers affiliated with the radical left"
"Martin Vorberg, of the Middle Eastern Workgroup, said the demonstration was aimed at Osem Industries, which he said has a factory in the territories, and spices from Amnon and Tamar, a company located in Alfei Menashe" (see link for full report). You have to give the Isrealis credit all the same, leaving the politics aside for a moment. They have created a thriving agricultural economy from an almost completely arid bit of land and are exporting potatoes to Ireland of all places. Think about that. That would be a bit like Ireland exporting sand to Saudi Arabia. They are a remarkably resourceful people and not just in agriculture – look also at the Silicon Wadi high tech successes. So Israel diverts as much of the Jordan as it feels like to irrigate its plants at the expense of everyone else, and we jump up and down a la an American cheerleader for them? I think not. the settlements. Israel has complete control over water resources in the West Bank and uses 82 percent of the underground water. The Palestinian daily consumption of water is 35 to 50 litres per capita, while the daily consumption of the Jewish settlers is 280 to 350 litres per capita. Criminal Court Act 2001 (ICC Act). Carmel Agrexco is Israel's largest importer of agricultural produce into the European Union and is 50% Israeli state owned. The warehouse is in Swallowfield Way, Hayes, Middlesex, and is their main depot in the UK. hand the suffering of Palestinians under Israeli military occupation. stating clearly why they are in breach of the law. Today's action aims to draw attention to this company's complicity, in murder, theft and damage of occupied land, collective punishment, apartheid and ethnic cleansing, and other breaches of International Law. When I see this campaign by so-called leftists (actualy anti-semites) it makes me glad to be in a sensible union like the NUJ where the exec have decided to ignore the looneys who voted for an Israeli boycott at the the ADM.
Support Democracy, Support a Free Press, Support Israel - a bulwark against islamic fundamentalist nutters. Actually, Palestinian workers organisations have called for boycott, including the Palestinian General Federation of Trade Unions. And workers organisations on these islands have responded - not simply the British academic unions - but also the TUC in Britain, ICTU and Mandate here, NIPSA in Northern Ireland. True, Israeli unions such as Histradut oppose the boycott of the apartheid Israeli regime, but I think you'll find that white South African workers also opposed the boycott of that country's apartheid regime. "It's very unclear who is being targetted in a boycott campaign. The Irish store? The Irish government? The Israeli producer? The Israeli workers?" The boycott, like that of South Africa, is targeting the - in this case, Zionist - regime (Zionist in its correct use of the term - the expansionist, apartheid, proxy-imperialist, colonialist, war mongering, racist power that is occupying the Palestinian Territories, Golan and Sheba). This is made clear in leaflets, press releases etc of the IPSC. Are Irish capitalists that produce goods to gain from people switching to another product? 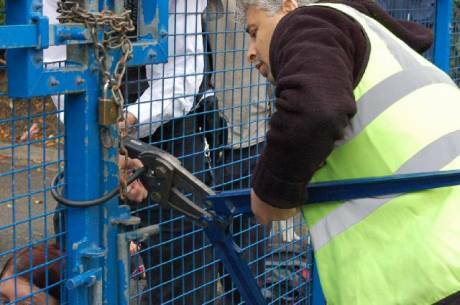 Do IPSC support 'native' capitalists over Israeli ones? As much as I - as a longtime leftist - wish it were not the case, unfortunately we live in a capitalist society where in order to eat and clothe ourselves we have no option but to shop in capitalist outlets - we cannot will workers co-ops into existence. Starting from that basis, the IPSC and the international boycott campaign generally, target stores that sell Israeli products. 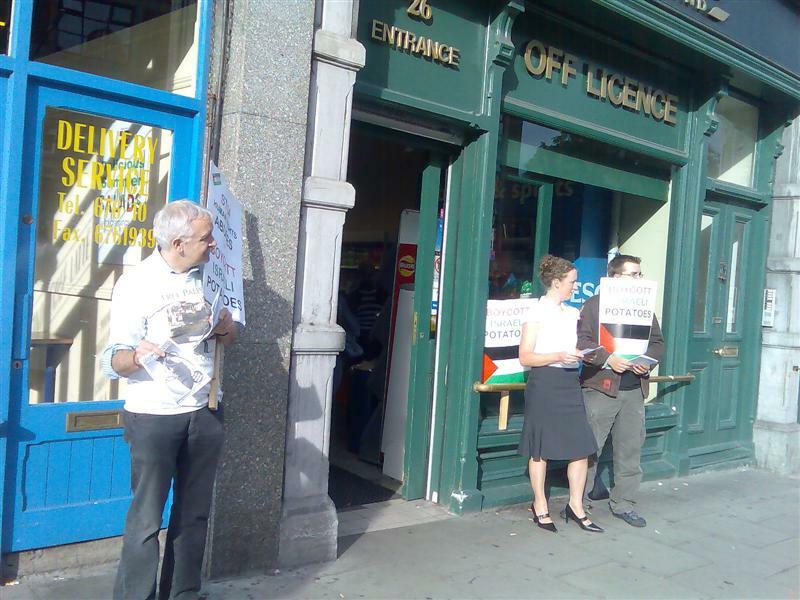 The IPSC does not ask consumers to boycott any stores (if they choose to do that, that is off their own bats) - rather the IPSC ask people to refuse to buy Israeli brands, and to complain to stores about the continued presence of these products in the stores. As to the second question - the IPSC is not an anti-capitalist organisation - it is an organisation in solidarity with the Palestinian people, and it is a politically broad initiative. The IPSC does not take a position on "which capitalists are better". No doubt those who are of a socialist-internationalist inclination hold that neither are 'better', while those of a more liberal bent think - well whatever liberals think about these issues, I don't know not being one. However, the real question is where tax revenues go - and in the case of Israeli goods/exports/trade agreements, they go to funding the continued (40 years and counting) occupation of the Territories and the human rights abuses, assassinations, jailings, home and agricultural destructions etc etc that go with that occupation. "There is also a philosophy behind boycotts that are highly individualistic. It's up to individuals to make buying decisions and if they don't make the right ones they are somehow to blame for what's happening in Israel. Boycotts fill certain peoples self-satisfaction that they are doing something and all others are wrong and are to blame. Very petty-bourgeois." All political actions are individualistic to some degree - individuals must make a decision, to join a protest, sign a petition, write a letter of solidarity, complain to TDs/local councilors etc etc. For example when the bin tax protesters were jailed for contempt of court, supporters were encouraged to write individual letters of complaint to various places (govt, local councils, etc) - I don't think anyone in the campaign blamed people who didn't write such letters for the jailing of the protesters - similarly I don't think the campaign got all holier than thou and aggressive with those who did pay their charges, thus weakening the campaign. So why assume that the IPSC attitude is any different towards those who refuse to boycott Israeli goods? 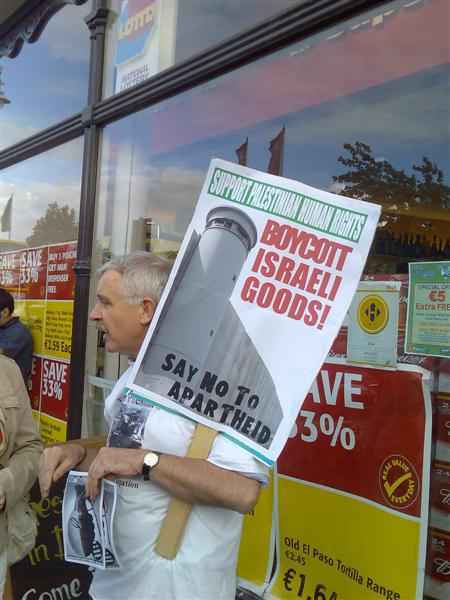 There are even IPSC members who disagree with the boycott campaign in general - none have been harassed or kicked out of the organisation for their views. The IPSC do not stick a badge of shame and blame on those individuals who purchase Israeli products (no more than the Killer Coke people consider anyone who buys a Coke to be actively involved in the murder of Colombian trade unionists) - rather the IPSC targets the stores which stock these goods, in an attempt to pressure them into ceasing the practice. And I'm sure in light of the recent ICTU motion to "actively and vigorously" promote a policy of boycott, overtures will be made to the relevant trade unions to refuse to handle Israeli goods. Importantly, the IPSC also use the boycott campaign to try to attract new activists to the organisation (hardly individualistic) and mobilse people around the various IPSC campaigns, just as the left groups use their weekly stalls to recruit interested people. "Boycotts can also help capitalists sow divisions among the working class if not taken up in a class way. The Israeli working class will be sacked if these potatoes are not sold and make profits for their bosses. Yet, there is no slogans defending Israeli workers rights coming from the IPSC. Surely anyone interested in the fate of Israel-Palestine would stand up for all oppressed - both Israeli workers and the Palestinians." As pointed out above - the IPSC is a Palestine Solidarity campaign, not worker-internationalist campaign. Individual members are free to have their own views on the Israeli working class (both Jewish and Arab) - personally I'm always glad to see Israeli workers taking militant action against their bosses (just as I'm always glad to see Israeli activists taking to the streets to oppose war and occupation, refuseniks going to jail instead of to the Territories). But it's a joke to compare the military/economic oppression of the Palestinians to that of working class Israelis (though a case may be made for a certain comparison between the treatment of Palestinian citizens of Israel and Palestinians in the Territories, though obviously those in the Territories have it much much worse than their brethren who found themselves on the Israeli side of the Green Line after the '48 war). Israeli-citizen workers of any ethnicity do not face the litany of abuses meted out to Palestinians on a daily basis. In fact some (Jewish) Israeli workers are subsidised to move into the land-grab settlements in the West Bank and East Jerusalem and commute to Israel-proper along Jewish-only roads from there. It's not only the lunatic National-Religious types who live in these settlements. On the question of the "sacking of Israeli workers if they don't make profits for their bosses" - surely this a problem with the capitalist system itself rather than the boycott campaign? In fact, you seem to be making the argument that internationalists should support the buoyancy of Israeli capitalism so that Israeli workers will not face redundancies - this is hardly a socialist position. Socialists argue for the end of capitalism and point out its inherent contradictions (and in this case the role Israeli capitalism plays in the ongoing destruction of Palestine) - we do not argue for support for it! And it also seems to be adopting a somewhat patronizing attitude toward Israeli workers - that they somehow don't understand why the products they produce for their bosses might be boycotted, as if the entire occupation is some mystery to them (most Israeli workers will have served at point or another in the military, and a lot of them will have spent time in the Territories) - or that they are somehow to stupid to realise that the actions of their government/state are the cause of the boycott. Of course, the situation in Israel is lot more complicated than such simple reductions - but we have to recognise that at the Israeli working class is not about to rise up and overthrow the Zionist regime and liberate Palestine anytime soon. Of course, this is not a static position and is open to change dramatically - especially if Israel starts and loses any more wars in the region, economic downturn etc. But Palestine is being destroyed right now (indeed, now with the collaboration of the new improved sickening FatahUSA), can Palestinians afford to wait around until there is an Israeli revolution? "The examples of Coca Cola in Colombia and South African goods in Apartheid will be thrown back at me. But there is a big difference with these protests. The SA boycott was called for by workers' organisations in SA and it was backed by workers' organisations in Europe. This cuts across the individualistic nature of boycotts and it answers questions about potential divisions in working class. Similarly with Coca Cola the boycott was called by a Workers' Union and it was implemented largely by Students Unions and indeed supported by trade unions also. Totally different situation." Its been pointed out already in this thread, but its worth reiterating, the 3 or 4 main Palestinian trade union federations (along with several hundred NGOs) have called for this boycott. The IPSC, along with those international trade unions who have endorsed the campaign (including the ICTU and COSATU), is responding to these calls from Palestinian worker-organisations. Obviously the Histadrut has not endorsed the boycott (in fact the bureaucracy is now calling for refusal to handle the goods of countries where trade unions have endorsed the boycott), but then the Histradrut has always been a Zionist trade union. After the outbreak of the second intifada, Histradrut cut all official links with the PGFTU, and as far as I know now only has informal links at best - it is basically itself boycotting the Palestinian workers. Also reading through their "Peace and security" resolution from 2002 one comes across this ditty: "The Histadrut supports active participation in the international coalition recruited for an all out war on the terrorism that has endangered world peace since its monstrous character was revealed by the events of September 11, 2001." In the anti-boycott section this same resolution it says "The Congress calls on worldwide trade unions - proponents of freedom and peace - to support the just goals of the State of Israel and its constant determination for peace and security." There is also plenty of condemnation of Palestinian terrorist acts and mourning for IDFers killed by the legitimate resistance - yet not a single (even mild) condemnation of the constant acts of Israeli state aggression against Palestinains. After the 2006 six election, the Histadrut also fully endorses the Israeli/Quartet boycott of the legitimate Hamas government (no I do not support Hamas, but there were the elected government) - and one presumes fully supports Abbas' Quisling regime. While one has to respect the effectiveness of Histadrut as a relatively militant union within Israel, we'll be waiting a long time before it gives a lead to Israeli workers in opposing the occupation. For more on the Histadrut-PGFTU relations (and support for the boycott of Hamas) see: http://www.tufi.org.uk/histadrut/ (4th post down). 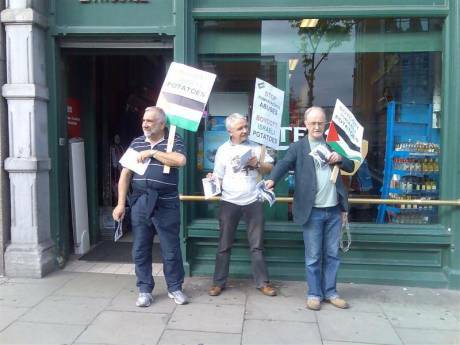 Dublin exile says: "it makes me glad to be in a sensible union like the NUJ where the exec have decided to ignore the looneys who voted for an Israeli boycott at the the ADM. [...] Support Democracy"
The hypocrisy is astounding! Support democracy, except in the union! Long live the bureaucracy! In a world where there are many injustices it is good that there are people who are prepared to show support for the underdog. It is important that those people who aare prepared to show that suppport know what they are supporting. It is obvious that the guiding lights of the ISPC are motivated by a hidden agenda that has nothing to do with support for the so-called Palestinians who are the architects of their own position and the pawns of the corrupt Arab States in the Middle East . The Islamists are constantly complaining that they are under attack from Israel and the U.S. and Uncle Tom Cobley and your readers may be interested to know who are the real enemies of Islam. Please try to absorb the following facts. The Bosnian War, March 1992 to Dec 14, 1995, saw 102,622 dead, according to the 2004 research from the International Criminal Tribunal. At least, 63,994 MUSLIM Bosniaks were killed, and the Tribunal estimated that about 38,000 were MUSLIM Civilians. Srebrenica in July, 1995, saw 8,000 dead, while the 1992 to Feb 29, 1995 Serb Siege of Sarajevo saw 12,000 dead, and over 50,000 wounded. At the hands of armed Serb Orthodox elements. 2. In the Kingdom of Jordan, their Sept 1970 suppression of the PLO threat saw up to 25,000 MUSLIM Palestinian Arabs dead. At the hands of the Muslim Royal Jordanian Army. 3. In MUSLIM Kosovo, 1998 to 2000 saw about 10,000 killed. 4. In Assad's Syria, in Jan 1982, up to 20,000 Muslims were massacred by Muslim government forces in suppressing the Muslim Brotherhood in Hama. 5. Egypt's Col Nasser, hero of the Arab street, gassed some 1,400 MUSLIMS in the 1963-1967 Yemen Civil War, using Phosgene and Mustard aerial bombs. Joining only Hitler and Saddam in gassing their own people. And overall, Yemen saw 100,000 -150,000 MUSLIM dead from 1962 to 1970. 6. In then French-run Algeria, in 1954-1962, some 600,000 MUSLIMS were killed in the FLN war with the French. 7. Another 100,000 MUSLIMS loyal to France, were also massacred by Muslim FLN elements. 8. And again in Algeria, the Islamicist gangs from 1991 to 2002 saw up to 200,000 MUSLIMS killed. 9. Sudan saw 500,000 dead from 1954 to 1972. 11. Darfur has seen at least 200,000 dead. 12. The Iran-Iraq War saw at least 450,000 MUSLIM dead on EACH side, or 900,000 minimum, with estimates of up to 1.62m overall. 13. Afghanistan saw 1m to 1.5m MUSLIM dead from Dec 24, 1979 to Feb 2, 1989. 14. The Taliban produced in excess of another 1m dead in Afghanistan. 15. The Russian-ruled territory of Chechnya saw up to 100,000 MUSLIM dead from 1999, and . 16. In Iraq, under Saddam, 200,000 to 300,000 MUSLIM Kurds perished. 17. The 1991-1992 Shia Rising against Saddam in the South saw up to 200,000 MUSLIMS killed. 18. The purges carried out by Saddam in Iraq killed up to 1m MUSLIMS. 20. Indonesia also saw 400,000 MUSLIMS killed in 1965-1966. 21. Bangladesh saw up to 2m MUSLIMS killed in 1971. 22. Somalia saw up to 550,000 Muslims dead from 1977. 23. Tajikistan saw 50,000 MUSLIMS killed from 1992 to 1996. 24. Iran has seen 10,000 MUSLIM Kurds killed. 25. Turkey has seen at least 20,000 MUSLIM KURDS killed. 26. Zanzibar in 1964 saw up to 17,000 MUSLIMS killed. 27. The Crusades overall killed only 1.5m from 1096 to 1270, including some 70,000 MUSLIMS in Jerusalem in 1099, and 100,000 MUSLIMS in Antioch in 1098. Maybe 900,000 MUSLIMS perished overall. 28. The MUSLIM Turks killed 1.5m Armenians in their 1915 to 1917 genocide. 29. Lebanon's 1975 to 1990 Civil War saw 130,000 dead. All the above figures involve rough estimates or ranges of dead, but the overall magnitude is what is significant. It clearly is, and for a very long time has been, extremely dangerous to either be a Muslim in the whole region, or to be at the tender mercy of armed Muslims, especially if you are also one. 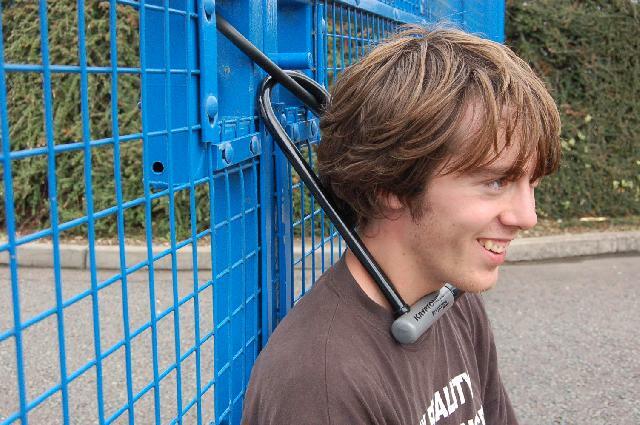 The safest place for a Muslim is to be facing Israeli gun-muzzles. And these same Israelis lost 1% of their population in 1947-1949. And over 20,000 dead defending their right to exist. As with the BBC TV Oct 1972 *Parkinson Show* impression by Michael Caine of the late Peter Sellers, *not many people know that*. Wonder about the BDS Brigade [boycott, disinvest, sanctions ] - they sure have one target-rich environment for their activism - if, that is, their real concern is about the slaughter of Muslims. Especially by fellow Muslims. As with Hamas slaughtering unarmed Fatah supporters in Gaza in June, 2007.
detesting Europeans with a bigoted, foolish, senseless hatred*. For those interested, the source of much of the bould Ross's guff can be found below in "related link"
Tell me Ross, if those figures were all twice what they are, and 100% beyond question, how would that justify Israels occupation of the West Bank, Arab East Jerusalem, and its treatment of the inhabitants there? And as regards the comments of the British at the end, do we therefore go on the less than flattering views of our former colonial governors as regards ourselves and hand back soverignty to the crown? Will you be out with the red paint to the post boxes?